Over the past couple of years it's become tradition here at BB for our final post of the year to be a reading goals update. So how did we do with our 2017 goals? Keep scrolling to find out! Don't forget to let us know how you got on with your 2017 goals, and which books you're planning to read in 2018! In all the years we've done Vow To Read lists on BB, I don't think I've managed to actually read all five. However, neither have I reached four before now, so I'm pretty pleased with that. 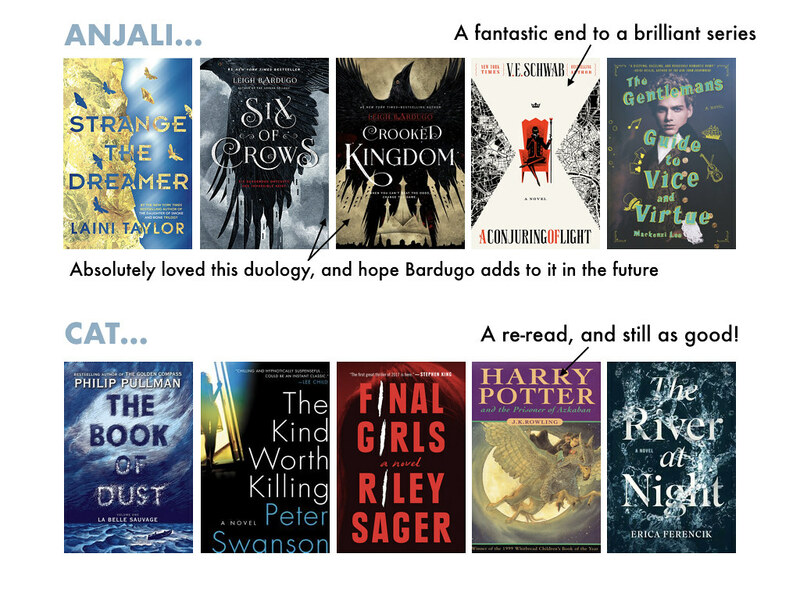 I have read some great books this year, but a few favourites have been the Six of Crows duology by Leigh Bardugo, A Conjuring of Light by V.E. Schwab, and Strange the Dreamer by Laini Taylor. Just like last year I only managed to cross three books off my 'vow to read' list. I'm still currently in the library queue for Always & Forever, Lara Jean so hopefully I'll get to finish the series soon. My library has also finally ordered copies of Scythe so I'll be adding that to my 2018 TBR too! I only managed to read The Graces out of the five I had planned, hopefully I’ll read the others next year. We would like to take this opportunity to thank all of our readers and everyone who has contributed to Blogger's Bookshelf throughout 2017. We hope to see you for lots more bookish talk in the new year, along with our brand new book club and newsletter! "We know you are here, our brothers and sisters . . .
Years ago, a world wide explosion of nanotechnology blasted the earth and fused humans with objects in their surroundings. Known as the Detonations, those unlucky enough to be outside the Dome ended up with deformities, while those inside were kept safe. Pressia lives outside the Dome with her grandfather. Partridge lives inside the Dome with his father. On her 16th birthday, soldiers come to Pressia to put her into the military, and as she runs from them she crosses paths with Patridge, who has run from his own home inside the Dome in the hopes he will find his mother. Partridge can't survive outside the Dome by himself, and Pressia needs help to avoid being caught by the law. As they work together on their individual missions, they end up diving far deeper into the secrets of the Dome than they ever realised. What they've been told from either side of the Dome is a lie. As we follow the story, we watch them discover the truth from both parties, about the detonations, and the scientists behind them. 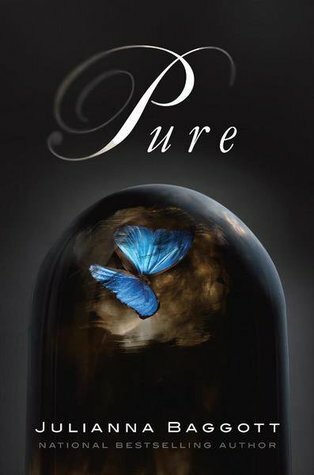 As well as a fast-paced story line, what I found really amazing about Pure was Baggott’s imagination. The detonations caused humans to be ‘fused’ with whatever was around them, touching them, or being held by them, at the time of the explosion. Bradwell, a young man who helps Pressie and Patridge, was running through a flock of birds at the time of the Detonations, and now has live birds fused in his back. Pressia, as a young child, was holding a doll at the time, so one of her hands has been fused with the doll’s head. Other characters are fused with actual humans. It's such a unique concept and one I haven't read about before. One thing I didn't quite get use to was the present tense writing style. I find it hard to get into a book written in present tense at times. What I did enjoy though, was the changing perspectives throughout the story, something that is done rather well in Pure. With interesting characters, soldiers who have guns fused into their arms, mechanical locusts, poisonous food, a fancy car, and a man called El Capitan, Pure was a good read with a mild cliff hanger ending. Fuse and Burn follow Pure in the series. As always, we'll be talking reading goals for the new year in January. Click here to let us know which five books you 'vow to read' in 2018! 1. 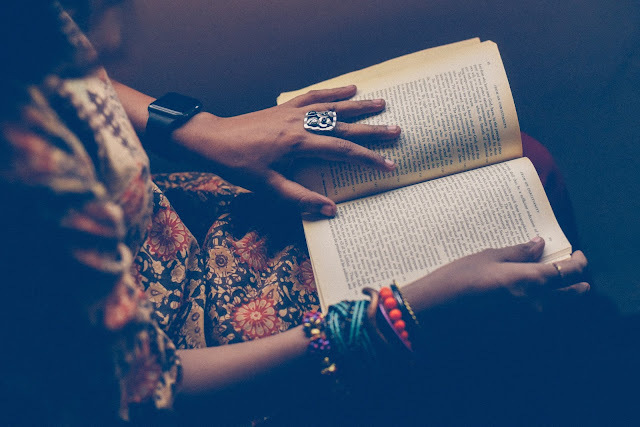 Affordable Reads - we all know reading can be an expensive hobby, but it doesn't have to be. If you're hoping to cut back your spending in 2018 you'll love Charlotte's list of top tips to ensure you can save the pennies and keep reading all the books! 2. 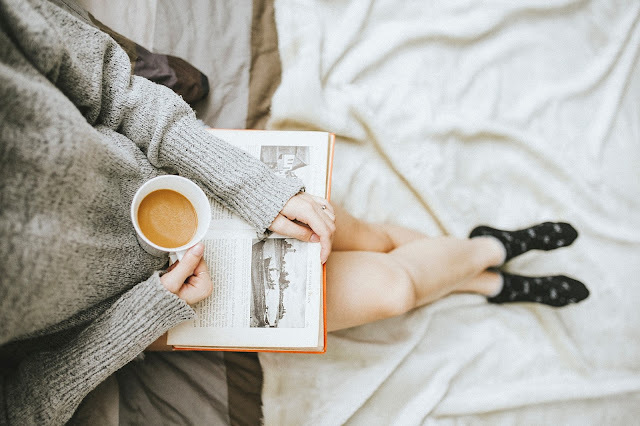 Treat Yourself - this monthly book club box from Cratejoy contains a personal development book plus other goodies such as tea, bath products, and accessories (US only). 3. Powell's - on her recent trip to Oregon Anjali recently visited Powell's Books, the world's largest independent bookstore. Over on her blog she shared an amazing bookish haul and all the details on what you can expect to see if you visit. 4. Writer's Block? - ah the dreaded writer's block... if you've been hit hard this post sharing six author's top tips on the subject. 5. The Best HP? 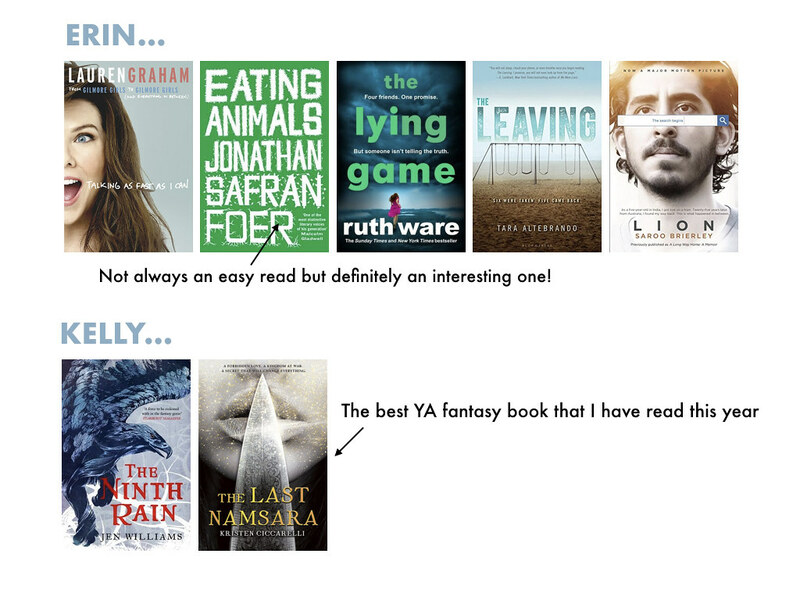 - we're big Harry Potter fans so we loved Sophie's ranking of the novels from her least favourite to favourite. 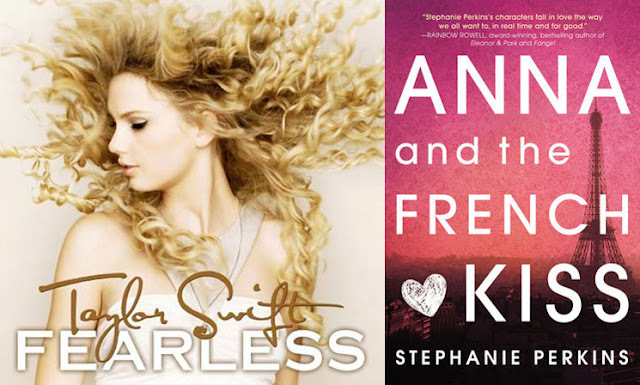 Do you agree with Sophie's list? 6. 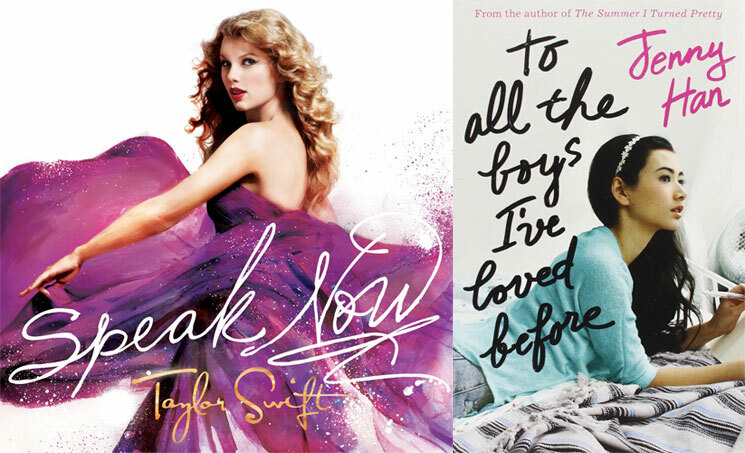 Teen Reads - we loved this list from Flavorwire which shares fifty books for modern teens. 7. 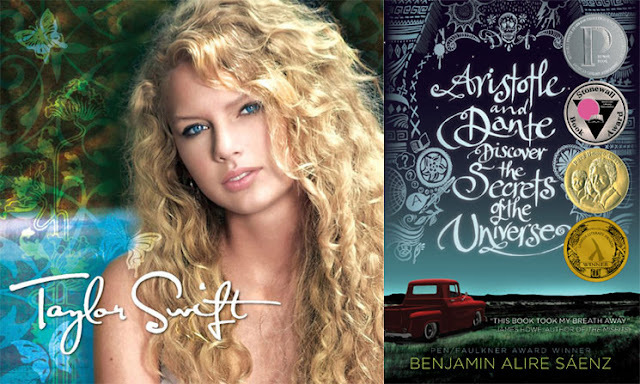 Reputation - if you enjoyed Anastasia's Taylor Swift inspired post, you'll love this fun article from Epic Reads which matches each reputation track to a YA novel! 8. Year In Women - if you're a fan of Rupi Kaur's popular poetry collections this one is for you. Head over to Brit + Co to find out more about the bestselling poet. 9. Book Of The Month - our BB newsletter is set to launch next month and we would love for you to get involved by helping us choose our next Book Of The Month. If there's a book you think we should feature you can let us know via this form. You can also sign up for the newsletter here! 10. Shelfie! - new year, new bookshelf? This post has some great ideas for how to make your bookshelves look extra beautiful. 11. Author Q&A - over on her personal blog Kelly interviewed Hélene Fermont, author of His Guilty Secret. Head on over to find out more about the book! Charlie Donovan knows exactly what she wants for Christmas: Teo Oritz. And she has a plan: to rig the paper's Secret Santa so that she can win his heart with five perfect gifts. But to do that she needs help. Enter J.D. Oritz, Teo's cousin and possibly the most annoying person on the planet. Having recently broken up with her ex-boyfriend, Charlie finds herself without a date to her friend Noelle's Lovers' Ball party, which also happens to be the hottest holiday party around. Everyone at school is talking about it and everyone will know if Charlie shows up dateless. Luckily, Charlie leaves nothing up to chance. Not only is she going to have a date for the party, she's going to have the most perfect date with the most perfect boy, Teo Oritz, and she has the most perfect plan to get it. Charlie's plan has two parts: 1. Rig the school paper's Secret Santa so she gets Teo and can give him five gifts that show just how well she knows him and 2. Spend as much time with Teo as possible so he can see how great she is. For both of those things she is going to need some help from Teo's cousin, J.D. Fortunately, J.D. is willing to help but unfortunately, that means Charlie has to spend time with J.D too. However, the more time she does spend with him, the more Charlie starts to think that may not be such a bad deal after all. Charlie needs to be in control of everything and while this story may revolve around a romantic plot, it's as much about Charlie learning to let go of her best laid plans as it is about her finding a date to a party. Charlie's mom has to work on Christmas Day, spoiling the usual traditions that Charlie is so fond of, and in order for J.D. to help her with her plan to get Teo to be her date, she has to give J.D. full control of what photographs appear in the school paper's special holiday edition. Giving up control is not something Charlie does lightly. For Charlie to have a good Christmas she needs to learn that not everything can be planned or controlled, and sometimes things turn out a whole lot better than you might have planned anyway. With a classic plot and plenty of holiday cheer, My New Crush Gave to Me is the perfect YA read for fans of cheesy Christmas romcoms and ideal for reading snuggled under the duvet with a cup of festive hot cocoa this holiday season. It's a little predictable at times, sure, but just like those romantic Christmas movies we all know and love, that's just part of the cosy charm of it, and there are still always a few fun twists and turns to be found. One of the greatest things about this novel is the friendship between Charlie and her best friend, Morgan, who run a homemade cookie company and edit the school paper together. It's the kind of friendship between girls that I would love to see more of in YA literature, and a really great aspect of this story. 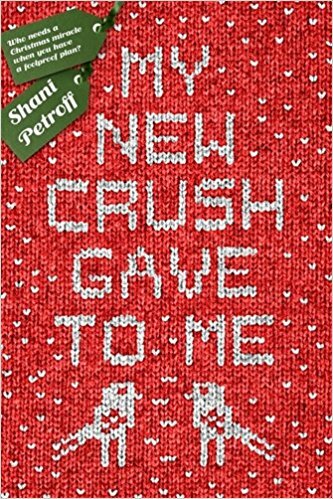 If you're looking for a cosy Christmassy read featuring a Secret Santa plot, an annoying yet lovable neighbour boy, an unforgettable Christmas jumper party, and lots of holiday baking, then this is definitely the book for you. I love short story collections. I particularly love short story collections with a very narrow focus, which is exactly what I got when I sat down to read Histories by Sam Guglani. This collection is a series of snippets from people’s lives. The common thread running through it? They’re all in a hospital. From med students to chaplains, and artists to oncologists, everyone in the hospital has their own story to tell. The stories are all set in the same week, though Guglani writes the past brilliantly in his work. Rather than stumbling over it, they are intricately woven within each of the stories he offers his reader. Many of the tales within Histories interconnected, brushing past one another with masterful subtlety. It is very cleverly done, that is for sure. It doesn’t feel at all overdone but helps you to piece together some mysteries within. You can also tell who does, and doesn’t, interact as all of the individuals within Histories go about their daily lives in a hospital for a week. Guglani’s writing is simply beautiful. It’s sparse and impactful, to the point of almost being poetic. He creates wonderful characters and shows a fantastic understanding of just what it is like to be human. I sincerely hope that I will be able to read some more of his work soon. In a chase and an unwanted scuffle on the precipice, Third Class Apprentice Historian Tom Natsworthy is thrown off the city of London and into the wastelands below. As he watches his city zoom off on it's caterpillar under-tracks, chasing a smaller city in the hopes of making it its next scrap-metal meal, he finds himself on an adventure he only ever dreamed about. With a girl, nonetheless. This girl is Hester Shaw, wanted by the London's leaders and on a mission herself to kill Valentine, a key London leader, who murdered her parents, attacked her and left her with a horrific scar running down her face. Katherine, Valentine's daughter, is in London trying to piece together the mystery of MEDUSA, and, with the help of engineer Bevis Pod, stumbles upon the truth of the city, her father, the death of Hester's parents, and so much more. As Tom is swept into a whirlwind of pirates and Airships, lies and betrayal, hidden truths and cyborg zombie-like people, he gets more than he bargained for. Mortal Engines was a really fun book. I picked it up because I knew that New Zealand's Peter Jackson (Lord of the Rings films) was writing a movie adaptation of it. I don't know about you, but I like to read the book before I see the film, and seeing as the movie is set to hit our screens in 2018, I thought I had better get onto it. I hadn't heard of Mortal Engines before, but it was such a fun read I'm gutted I haven't picked it up before, especially in my younger years. The idea of cities on wheels and steampunk contraptions is absolutely fantastic! The story is set in the distant future on earth, where the land has become dry and derelict, so the cities have to move around and 'eat' other cities for scraps to keep going. Brilliant! I love this idea. 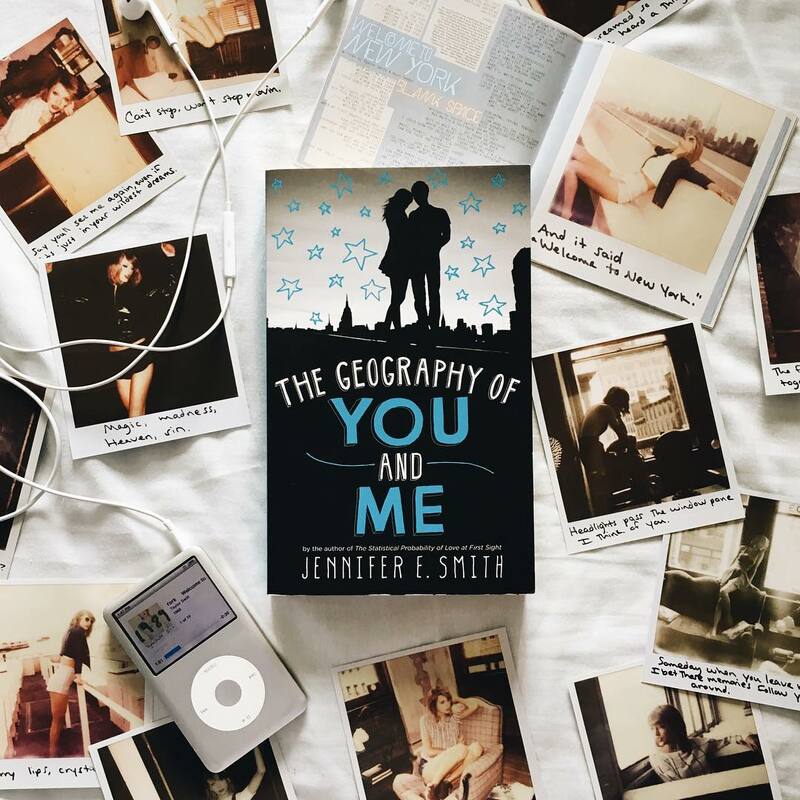 I really liked the characters, and while they are 15 years old, it was definitely written for that age group and not us adults who just like reading YA books. The writing, therefore, was super easy to read and I managed to get through it in just a few sittings. Not really being a reader of steampunk (bar Cassandra Clare's Infernal Devices series), I found it a nice refreshing genre to dive into. If you're not into steampunk, then this is a perfect light story to get into. I am definitely looking forward to what they do with the movie, and can't wait to see these cities in action! 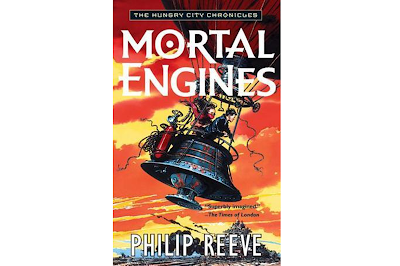 Let us know if you've read Mortal Engines, or anything else by Phillip Reeves. As we mentioned in our big book club announcement post (catch up here if you missed it!) 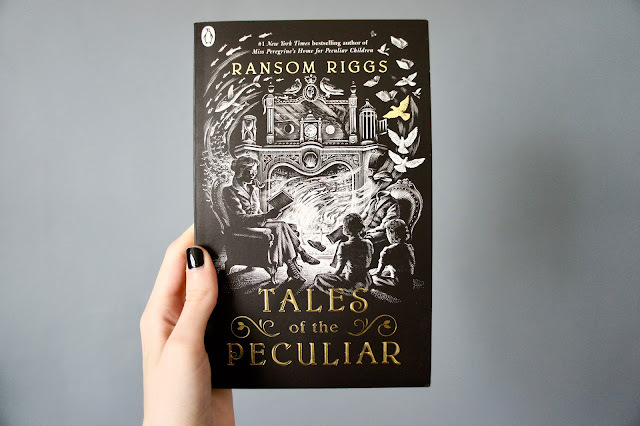 our theme for the year is Short Stories which can include anything from novellas to poetry collections, flash fiction, novels under 200 pages, graphic novels and short story collections like our first pick; Tales Of The Peculiar by Ransom Riggs. Suggested by Ria, this beautifully illustrated short story collection is a spin-off from the popular Miss Peregrine's series. With an intriguing premise that promises unique stories set in a wonderfully mystical world we think this is the perfect title to launch our book club and can't wait to dive in! Don't worry if you haven't caught up on the rest of the series yet, not all of us have either and this is one of the reasons we think it's a great choice for our first BB Book Club pick! It isn't essential to have read the Miss Peregrine's series in order to enjoy these short stories and we think it's going to be interesting to hear from both those who are familiar with this world and those who aren't. We would love it if you'd like to join in and read along any time over the next month, then complete this Google form by 19th January to share your opinions with us. You can also use the hashtag #bookshelfbookclub to share your book photos and thoughts with us! You can pick up a copy of Tales Of The Peculiar over on The Book Depository who ship worldwide. 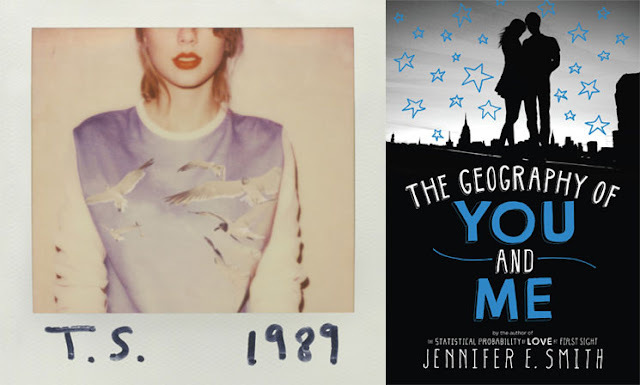 We'll be introducing February's book selection, chosen by Anjali, at the end of January - so don't worry if our first pick doesn't sound like your thing! The last two years I've shared some holiday gift ideas for book lovers on this blog and as the holidays are all about tradition, I'm here to share some more today! 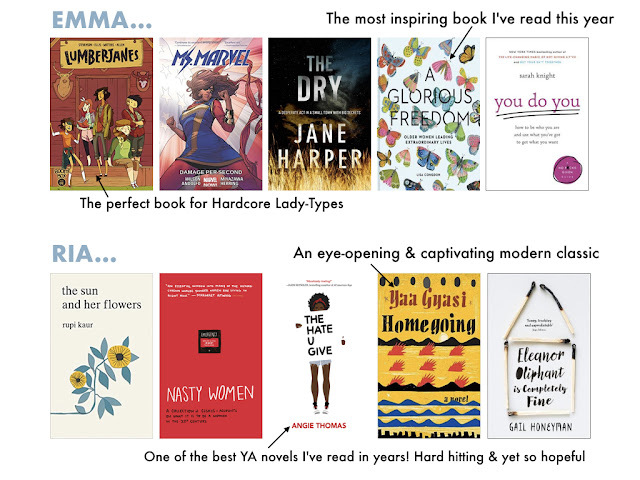 If you've got a book loving friend/relative and no idea what to buy them, I am here to help. Literary Emporium are particularly great at enamel pins and this year they've started selling some inspired by gothic novels, dystopian novels, and now Shakespeare's heroines. These three are just a few examples of a much wider selection available on their website and I think one of these pins inspired by your loved one's favourite novel would be a gorgeous gift. You can never go wrong with a beautifully designed copy of someone's favourite book and this collaboration between Vintage Classics and MADE.COM definitely fits the bill. 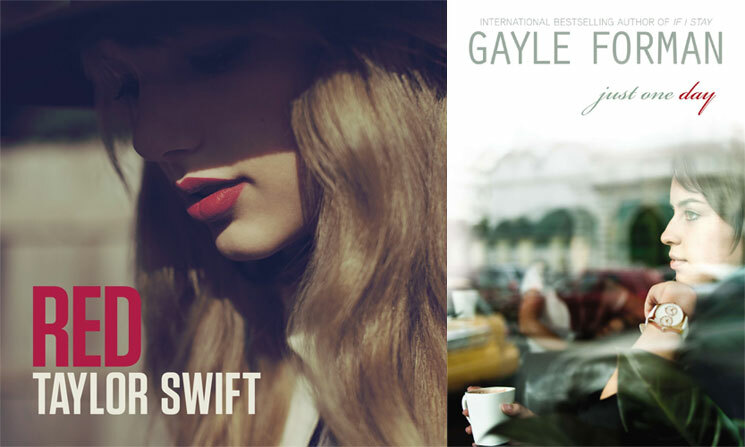 Unfortunately these are the only three novels to have been given the MADE.COM treatment so far but if you know someone who loves any one of these three titles, then I'm sure these gorgeous covers would be a welcome addition to their collection. If you know someone who A) likes to carry a book with them at all times and/or B) likes to keep those books pristine, a pouch to keep their book safe in their bag might be just the gift they never knew they needed. There are hundreds of book sleeves to choose from on Etsy and around the web, these just being three adorable examples. And, if you're the sewing type, you could even make one yourself! If dystopian and gothic literature aren't your friend's bag, Fable & Black do a whole host of super cute pins to choose from. Some, such as this Howl's Moving Castle pin are still specific to certain books, but many others, equally as adorable, are more general to all book lovers, and every one would look perfect on a book lover's jacket or backpack. My last suggestion, and, I think, the most lovely, is a special edition of a favourite children's book. 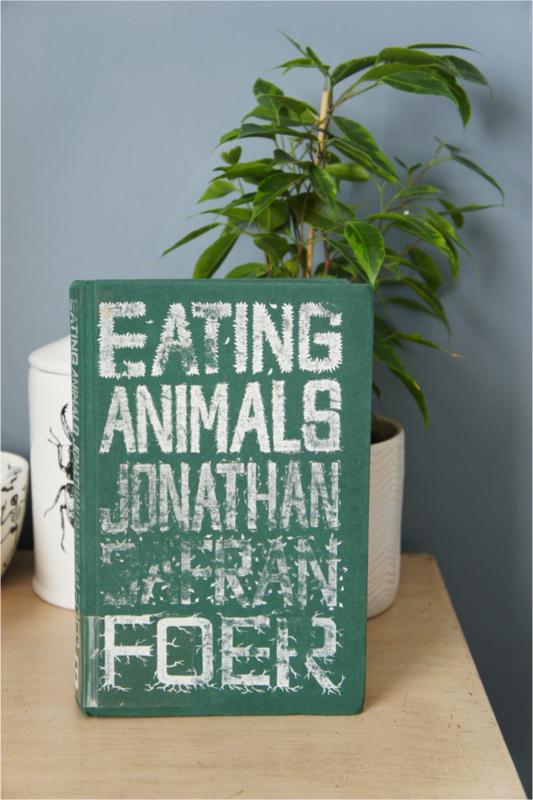 The novels we loved as children often remain the most special to us and I think a beautiful hardback edition of someone's childhood favourite is always going to be a winner. Puffin Classics do a wide range of hardbacks with pretty patterned designs, including this edition of Charlotte's Web and many more besides. If you want something even more special, design house MinaLima and Harper Collins have released a few of these gorgeous interactive, illustrated versions of popular fairytales and stories, each as stunning as this copy of The Beauty and the Beast. And last but not least is the Puffin in Bloom collection, all of which have covers every bit as beautiful as this edition of Heidi. As an adult, I have fallen in love with the Dear America series (and its spin-offs) which sheds light on historical events through the everyday lives of early teens. The one book in this series that stuck with me after reading it a few years ago is Anetka's story. Thirteen-year-old Anetka is forced to leave Poland for Pennsylvania, US after being 'sold' as coal miner's bride in exchange for passage to the US. Through her diary entries, we get to know her struggles as an immigrant, a young wife and mother to three girls. I was floored by her resilience and how she was able to deal with her own insecurities in fitting into her new roles and still remain sane. Anita is passionate about going to college and will do everything to make it possible including passing herself as a white person. Being a "high yellow", a black person who so light-skinned that she can be passed off as being Caucasian, she and her brother take the chance to further their education at prestigious schools. 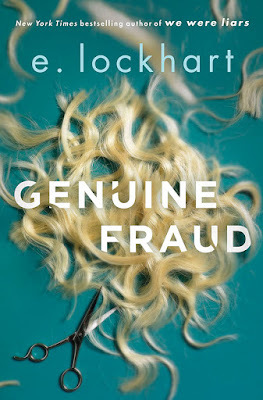 However, this janitor’s daughter is in danger of being exposed when finds herself rooming with Louise “Lottie” Taylor, the scion of one of New York’s most prominent families in her senior year. You will enjoy Anita’s journey in her last year of college and she manages to navigate sticky situations with her determination to graduate and have a “normal” life. Set before the turn of the 20th century, this atmospheric book will make you privy to how people were dealing with the industrial revolution in the backdrop of major issues of the day like slavery and racism. Ramatoulaye is a Senegalese schoolteacher who is grappling with the death of her husband and dealing with her co-wife. In this book, she pours her heart in this lengthy letter to her best friend Aissatou, who is now an ambassador in America as a cathartic means. Through Ramatoulaye, we learn about the challenges that women faced in post-colonial period attempting to have it all. Readers will empathise with her situation and make you appreciate some of the everyday opportunities we have to make a difference but some may still be denied in some other parts of the world. This is one of the books that exemplifies the phrase, 'dynamite comes in small packages'. Originally published in 1979 in French, Ba is able to articulate the women's issues powerfully in this missive form and which is still relevant in 2017. Rachel is excited about returning to Kenya in the 1950s after spending most of her teenage years in Britain following the untimely death of her mother. While staying with her grandparents inhibited by their strict rules, she is eager to return to the familiarity of her childhood. When she finally sets foot in Kenya, she soon realised that things are not the same as the Mau Mau freedom fighters threaten the settlers' stay in the Kenyan colony. Through Rachel's naive eyes, readers will be given glimpses into the relationship dynamics between the Kikuyu people and the settlers in the backdrop of impending independence (unknown to the characters). Her free spirit and courage are seen in the way that she treats the Kikuyu and is constantly concerned for their welfare. But at the same time, she does not shy away from questioning important issues. Lillian prides herself in living in one of the most beautiful countries in the world: Kenya, plus owning more books than shoes. She has not met a brooch that she has not liked. She still harbours the dream of ordering vegetarian paella in impeccable Español. You can compare bookshelves on Goodreads or read about her bookish adventures at Kerry’s Blog. Sometimes you just know that a book is going to break your heart. Sometimes you go ahead and read it anyway. He’s not the only one who thinks he might be guilty either. Some of his friends’ family members certainly do and, worst of all, there might even be a criminal investigation into the accident. How can Carver even begin to heal when he is stuck in that moment over and over again? And then his friend’s grandmother asks him for a goodbye day: a chance to say goodbye to Blake, her grandson with Carver at her side. If you couldn’t tell from that brief summary, this book is intense. In the best possible way, it breaks your heart over and over again. I was even crying in the car home while I read it (don’t worry I wasn’t driving). But it also pieces it together again with little snippets of loveliness that you will treasure. Goodbye Days is definitely hard to read in places but it is also utterly beautiful. I would definitely recommend reading it - just keep some tissues on hand! 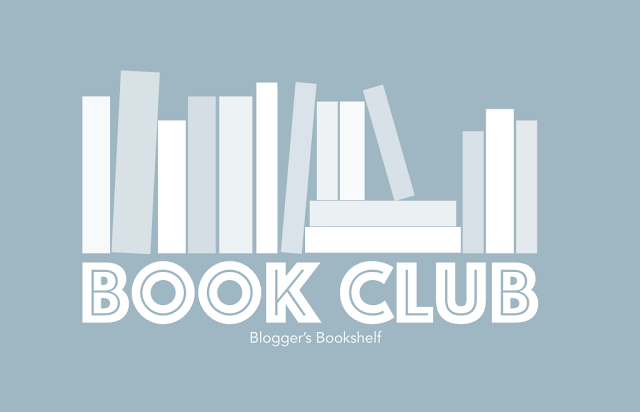 To celebrate five whole years of Blogger's Bookshelf we've decided to embark on a new adventure by starting our very own online book club! We're always looking for new ways to collaborate and share the love of books so a book club seemed like the perfect next step for BB. We'll be taking it in turns to select the book club reads every month throughout 2018 and to keep things interesting we've also chosen a simple overall theme we'll all have to stick to when we make our selections. The theme we've chosen is 'Short Stories' which may include a wide variety of reads such as novels under 200 pages, novellas, graphic novels, poetry collections and of course, short story collections. 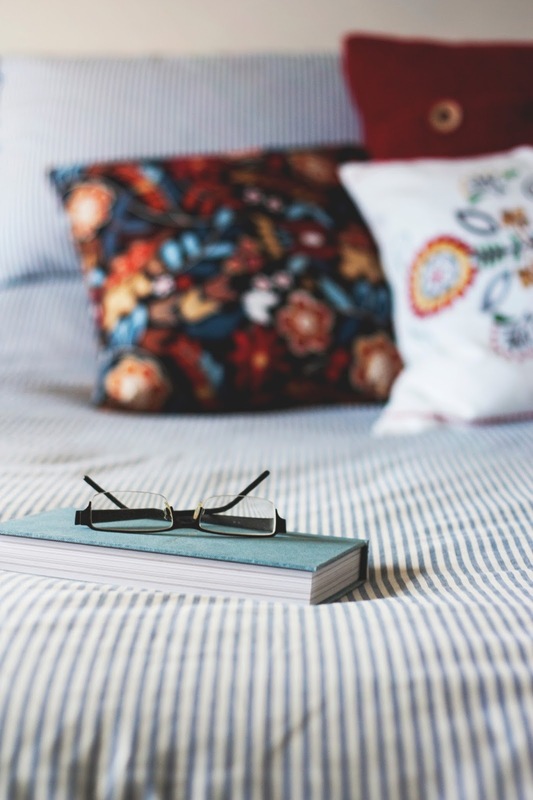 We're excited to discover new reads that fit the theme and by keeping the reads nice and short and we hope you'll be able to find a little time to join in too. Each new book will be introduced in a post by the team member who has selected it, we'll then be inviting you to read it along with us over the following few weeks, with a Google form for you to submit your thoughts for the final roundup. 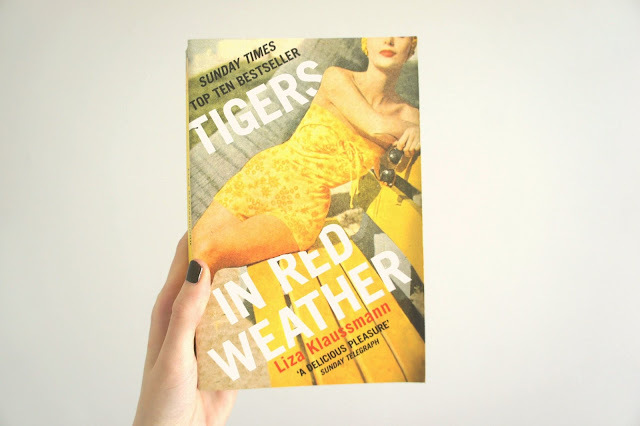 There may also be additional posts inspired by the book club pick throughout the month and updates via our new newsletter (also launching next month) so make sure you're subscribed if you don't want to miss out! We'll be announcing January's book next week and hope that you'll join us on our new adventure, whether it be every month or a handful of times throughout the year. "The life of the salmon is a predictable one: swimming upstream to the place of its birth to spawn, and then to die." 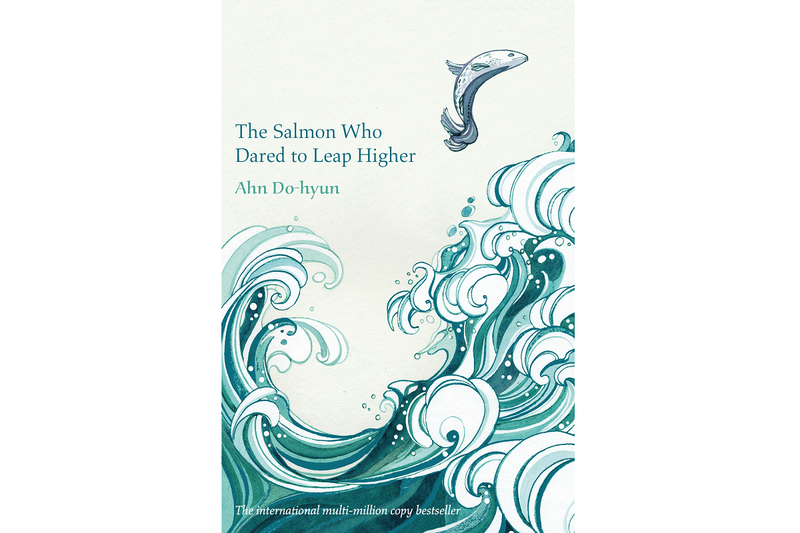 Translated for the first time from Korean to English, The Salmon Who Dared to Leap Higher is a sweet fable about life and its meaning, all from the perspective of a silver fish. As we follow Silver Salmon through his life, we learn, as he does, that he's different from other salmon, that he thinks differently, questions why certain things are done, wonders why a salmon's purpose in life is to swim upriver to the place they were born just to spawn and then die. Surely there's more to life than that? 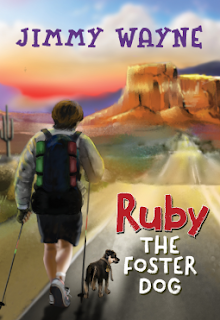 As Silver Salmon loses his friends, gains others, falls in love, learns about the world, and avoids attacks from eagles and bears, he learns about his past and his ancestors who dared to leap above the rapids and finally make it home. While it is a fable, a short story written to make you think about its morals and life lessons, it's beautifully written and so on-point with life (human life, that is) that it really does make you pause every so often and really take in what Do-hyun is saying. 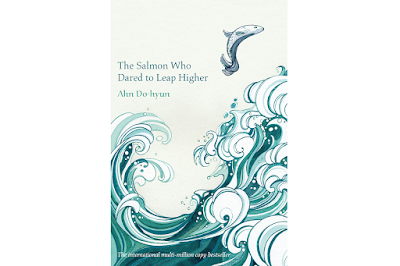 Filled with stunning illustrations, The Salmon Who Dared to Leap Higher is a wonderful look at what it means to grow up and live this crazy life. A short book just over 100 pages, this fable is a wonderful wee read that I recommend picking up if you have a spare hour or so.